Basundi is a easy-to-make milk sweet dish with a nice flavor of cardamom (elaichi/welchi) or kesar. Dry fruits especially charoli (chironji) and some nuts like almond, pistachios, cashews are also added to Basundi. This Creamy sweet milk recipe is called as Basundi in Marathi and Gujarati.It is a traditional sweet recipe of Maharashtrians and Gujaratis , they make this recipe on Kojagiri Pornima / Sharad purnima, dushera, Akshay Tritiya and on many festivals. Basundi is served with puri or served as a dessert at the end of meal. The puri which are served with Basundi are made from whole wheat flour with little salt in it. This recipe is very easy and doesn’t require much preparation as compared to other sweet dishes. In North India, the thicker version of Basundi is prepared. This is called as Rabdi or Rabri in Hindi. Rabri is heavier in terms of calories and generally prepared during winter season. 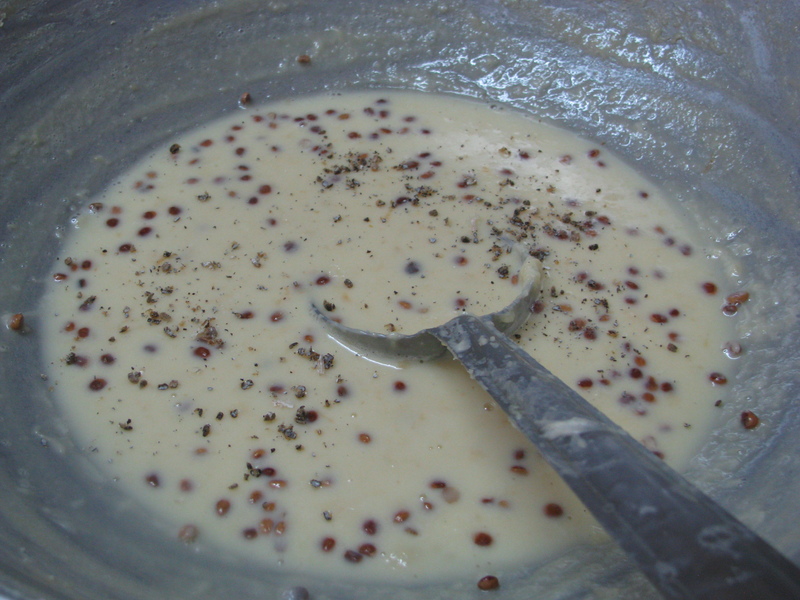 Whole milk is boiled until it becomes ¾ to ½ of its original volume to make Basundi. 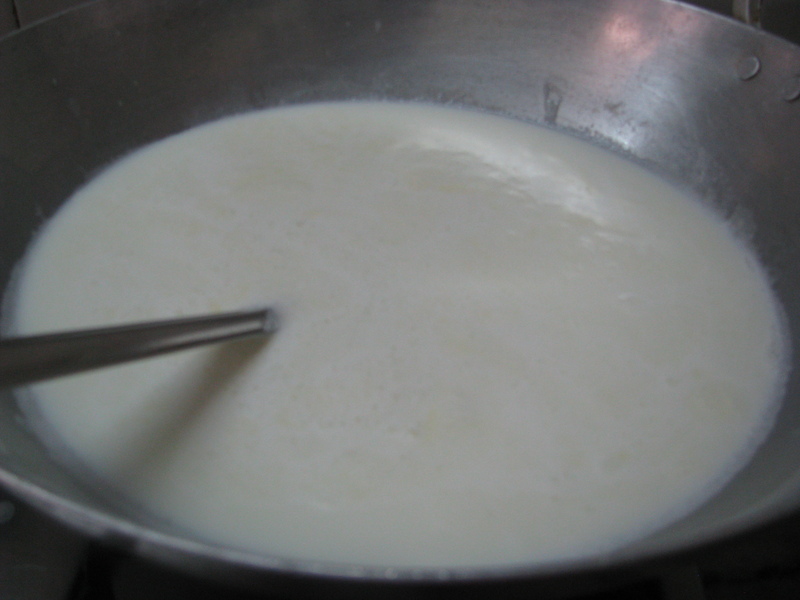 To make Rabri, whole milk is reduced to 1/2 or even 1/4 of its original volume. Rabdi is very thick with lots of malai / heavy cream as compared to Basundi. Rabdi is generally served with jalebi in Madhya Pradesh. 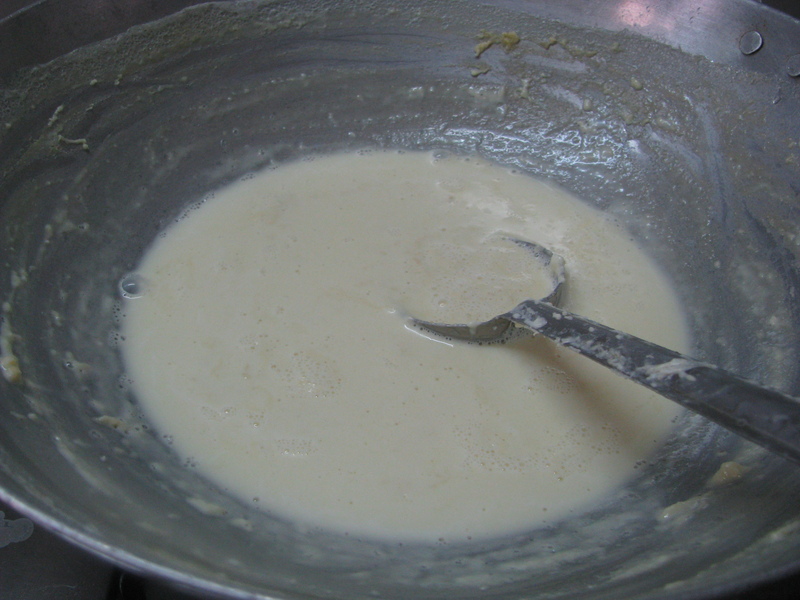 The preperation of both Basundi and Rabdi is the same – just boil the milk more if you want to make Rabri. This recipe can also be eaten on vrath / fast /upwas. There are lots of ways in which you can make Basundi quickly. I have explained Basundi in a authentic way with whole milk but if you’re in a hurry you can use the quick Basundi tips which I have shared at the end of this recipe. There I have shared how to make Basundi with condensed milk, khoya (mawa / ricotta cheese), cream or evaporated milk powder. I have explained how to make Basundi or Rabri in a traditional way. Do share your comments or suggestions for this recipe. 1 tablespoon charoli ( chironji) – if u want to make Basundi. 1 tablespoon finely chopped dry fruits of your choice, I have used pistachios ( pista ) in this recipe. I have used heavy bottom big pan ( kadahi ) to cook this recipe. Or reduce it to 1/2 if u want to make Rabdi. Even if you feel that the consistency or thickness of this recipe is not up to the mark but it gets very thick when it gets cold. Add sugar or sugarfree (if you want to make this recipe for diabetic) and boil it for 4-5 minutes. Remove it from flame . If u dont like malai which is formed during evaporation of milk blend this thick basundi with hand blender .This step is optional. Add charoli ( chironji). In Rabdi we don’t add charoli but in Basundi it is a must. Add finely chopped dry fruits. Let it cool down. It will become thick. Serve hot or chilled Basundi or Rabdi or rabri. Tips for making quick and easy Basundi / Rabri recipe . Basundi / Rabri made with this method is very quick. For 1 liter of milk 250 gms khoya ( mawa ) is required. Boil the milk, mix khoya with 1cup of cold milk with hand blender or in mixer. Add it to the boiling milk, let it boil for 5-6 minutes. Add 3/4 to 1 cup of sugar or 1 tablespoon sugarfree. Remove it from flames and adddryfruits and cardamom powder as mentioned above. In this method you can use homemade cream or Amul fresh cream which is easily available in market. With this method, you can make Basundi / Rabri quickly and it can be made without sugar. In condensed milk, lots of sugar is present so it cannot be used for diabetic people. For 1 liter of milk, you will need 1 or 1 ½ cup of fresh cream. Boil the milk, add cream to it. Boil it again stirring it continuously for 6-7 minutes. Add Sugarfree or sugar according to your taste . Add dry fruits and cardamom as mentioned above. This is also a quick recipe. You can make this recipe when u want to make a quick dessert . When I was in Pg accommodation we tried this recipe .Boil 1 liter of milk, let it cool down. Add 1 cup of milk powder and 1 cup of condensed milk or fresh cream to it. Boil it for 6-7 minutes stirring it continuously. Remove it from flame, add dry fruits and cardamom powder to it.